Set on ‘The Wild Atlantic Way', one of the worlds longest coastal touring routes. This home is based in Upper Killult, Gortahork. 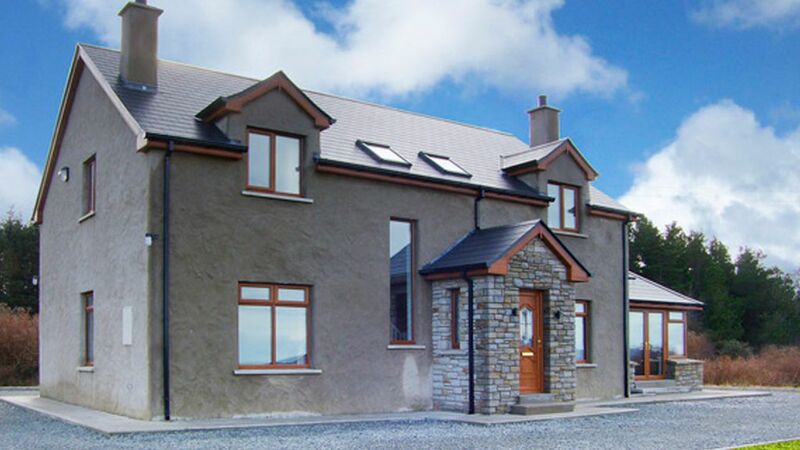 This Property is located along the coastal road between Gortahork and Falcarragh. Gortahork is in heart of the Gaeltacht where Irish is still the first language you can enjoy live music and a sea side setting. Falcarragh is a vibrant village located in West Donegal Gaeltacht. Both villages boast blue flag beaches. Dunfanaghy is only 10km away and is one of Donegal’s most popular holiday destinations and features many fine restaurants and pubs. Glenveagh National Park: About twenty minutes drive away from the cottage this magnificent national park is home to herds of red deer and golden eagles. Tory Island: Daily ferry trips to Tory, located 9 mile off the Donegal coast, leave from nearby Magheraroarty pier. Although only 4km long and 1 km wide, the island has 2 towns, East Town and West Town. Ards Forest Park Located 3km south-east of Dunfanaghy, this wonderful park has marked nature trails and is also a wildfowl sanctuary. Scenic drive at Horn Head nearby. Other attractions: Gartan Outdoor Pursuits Centre: Situated on the shores of Loch Gartan this is a very popular destination for adventure holiday enthusiasts. Glebe House and Gallery: This is a Regency house built in 1828 set in woodland and decorated with William Morris textiles and Japanese art. The gallery houses the renowned Derek Hill Art Collection. Arnolds stables in Dunfanaghy offers horse riding and lessons on local beaches and off road terrain. The Dunfanaghy surf school, 5 miles away, offers surf, windsurf and dive. An Chriit Leisure- This excellently equipped leisure centre includes a fitness room, steam room, themal jets, sauna, treatments, kids pool & swimming pool. The area is rich with Arts and Crafts: Galleries include The Art House; Green Door; Workhouse and Greendoor Galleries. Or visit McNutt tweeds nearby. The area has loads if cf charming restaurants and pubs. We recommend The Cove Dunfanaghy, superb local organic produce. Also great is the Mill serving local seafood nightly. Other great pics include Arnold's, Lizzies, the Starfish Cafe, Muck and Muffins, Buttermilk and more. Local hotels also have superb menus including Lough Altan. Something Fishy does the best takeaway fresh fish and chips for miles. As you may well be cooking we can recommend the names of good local fisherman for catch and cook. The Green Man deli has a great range as do supermarkets in Falcarragh. There is a local farmers market in the square each Saturday selling locally caught fish and shellfish. The area is also great for foraging. Finally there are three local lake with Brown Trout and rivers include nearby River Ray. For kids there is lots on offer locally including Karting, Tropical World, Kids Farm, activity centre Dunlewey, Boat Trips and pony rides. Great holiday home, fantastic view! While the kitchen lacked bowls and a few things like that, the house was clean, new/well-maintained, and very comfortable for a larger group. It’s good to have a car, but the walk to town is easy and the house is well located for walks to the beach etc. North Americans should be aware of the pay as you go electricity model. The home had everything we needed, and was a great place to stay. The hosts were very helpful and responsive. Friendly owners, great property and fantastic views. Directions perfect and met by friendly owners with a very welcome offer of a cuppa. House very spacious and lovely with wifi/netflix (albeit bit intermittent given on top of the hill). Everything possible you would need in the house and quite a good bit of grass area for kids to play. The view however was the highlight and even though we weren't lucky with the weather it was to die for. Walking distance to Falcarragh beach which is gorgeous and the town with a couple of good pubs and walking distance to Gortahork as well albeit only really the hotel and shop there. Great base for touring gaeltacht area of Donegal. Great family get a way house. Definitely will be back. We were 3 french couples to visit Ireland ! The house was perfect, ideally situated, there is no neighbour (only 1, not disturbing) it is a very relaxing area, quiet area, view on the sea !!! We have seen the most beautiful sunset ever ! The commons areas were very practice, you have everything that you need (you can wash your clothes, you can cook everything, you can watch the TV in amazing sofa, you can play to the Play station, or just relax in sofa looking at the beautiful view ...). There is 4 rooms 2 doubles+ 2 twins, the owner was very nice and accepted that in 1 room we can put the twins beds next to each other as we were 3 couples. All the rooms have there private bathrooms !! (instead of the twins rooms, 1 bathroom only for both but there is a other bathroom on the ground floor). This house is perfect for 6 or 8 people, very spacious, and you can have privacy. This house is only for people who have or rent a car. The only 2 small negatives points is that the house is not easy to find despite owner's informations and for my case the owner was not here for welcome us (anyway we arrive very late...). We have amazing time in this house. We definitely recommand this place !